Many parents can be worried about their children regarding: suspected autism, behavioural problems and learning difficulty / disability. It is easy to become very anxious re their children and frustrated in waiting for the school to carry out their assessment, which can take up to a year. During this time parents still require help and support for their children and themselves to help with situations at home and for general advice. We have collected some useful resources here that may help families and provide extra support here. Please remember to ensure you have full access to your GP electronic health records and that of your loved one so that you can ensure you have the correct diagnosis including what disabilities their may be so that you can share this with others if and when you need them. Your GP can help if you are unsure what to do. Being able to easily book appointments, order prescriptions, send secure messages and access your electronic health record as a patient or as a carer will make life easier for you. 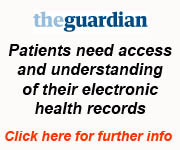 (40% of all our patients with Learning Disability already have full access to their records). You can also refer to this webpage to keep yourself uptodate with the latest information as well. Please inform us if you find other resources that may have helped you too so that we can add to this list as well for the benefit of others. Scroll down to the bottom to learn more about the Special Parent! Remember to register as a Carer if you care for a child with special needs. Please ask at reception or speak to a doctor or nurse to find out more. You can learn more here. See what Trevor Clower has to say as the carer for his own son. Tameside Special Educational Needs and Disability (SEND) Information, Advice and Support (IAS) Service. Tel: 0161 342 3383. Information, advice and support throughout the Education, Health and Care Plan (EHCP) assessment process and review process. Also information about existing Special Educational Needs (SEN) Statements and review process. We apply for funding to enable us to organise clubs, activities, discos, day trips & residential weekend breaks. We provide confidential advice and support for parents on a whole range of subjects but, if we don’t know the answers we will find someone who does! If you would like more information about the work that Our Kids Eyes does, then please feel free to contact us either by phone 0161 371 2084 / 0161 371 2066 or via the contact form. Click here to find out more about what support is available for children with Autism and their families. Another new group aimed at parents of adults withAutism Spectrum Disorder but also including partners of those on the spectrum and open to all those who know and/or support family members or friends. The group aims to provide friendship, understanding and sharing with others who might have similar experiences. Please see below for more information. 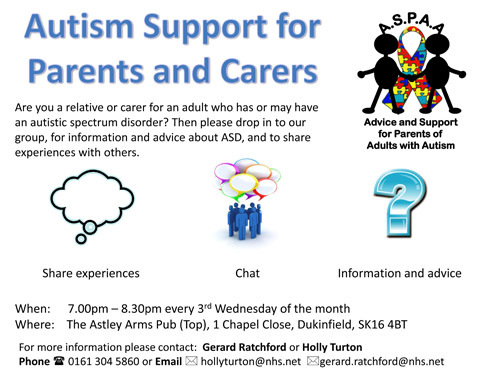 TASCA are a parent run support group for autistic children and their families within Tameside and Glossop area. They have a monthly drop-in coffee morning at Rose Hill Children's Centre in Ashton and monthly evening event at Bizzy Bouncers Play Centre in Hyde, exclusive to tasca children and their siblings. They have recently launched a monthly ’10 up zone’, organise regular trips and outings and host an internet forum. 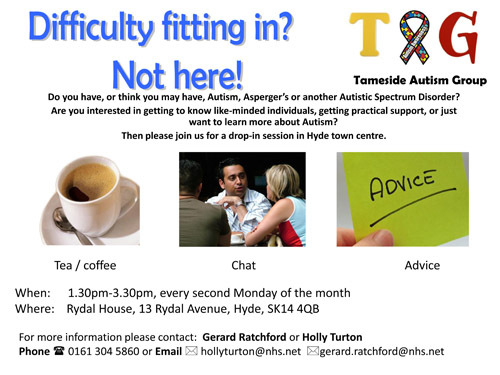 If would like to know more about autism, current developments in Tameside, or if you have any questions please contact Ged Ratchford – Autism Specialist Nurse. Yvonne Newbold says "Doing whatever it takes to make life easier for special needs families and the staff who work with them". Being the parent of 3 children with Special Needs, she realised parents like her are Special Parents because only they know their child better than anybody else and often know more about what is going on with their child than everybody else including the "experts" looking after your child. That makes sense really but have you ever thought about it like this. No? Yvonne Newbold is a writer, speaker, workshop facilitator and consultant in issues relating to disability who has written a book named The Special Parent’s Handbook based on her experiences of bringing up her own disabled children.